Adidas has launched its new high tech soccer shoe on the market with high tech TV spots that features its customizable nature, timed for the lead up to the FIFA Football World Cup in Germany. 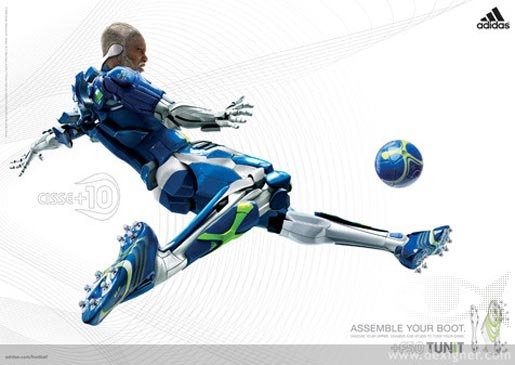 Soccer players are invited to assemble their boot, choosing their upper, chassis and studs to tune their game. 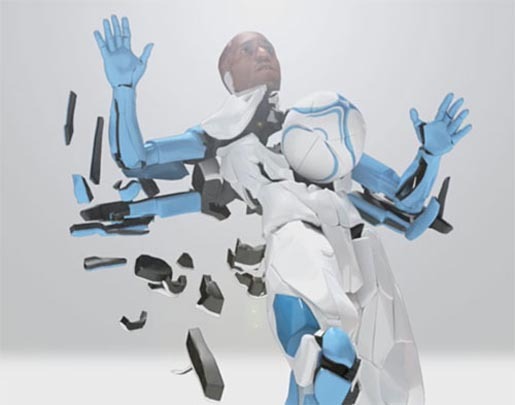 The first spot features a CG player being disassembled and reassembled to the sounds of classical piano music as he interacts with a soccer ball. The tagline: “A player is greater than the sum of his parts”. The Modular Man campaign was developed by 180/TBWA Amsterdam, by executive creative director Andy Fackrell, creatives Lee Hempstock and Chris Landy, executive producers Peter Cline and Cedric Gairard, and agency producer Kate Morrison. Director was Arvind Palep at 1st Avenue Machine with executive producer Serge Patzak. Sound was designed by Draken Bosnjak at Q Department with technical director Alex Monteiro. Music was provided by The Lab. METAphrenie, a Berlin-baed design and production company, created two 60 second spots with a techno soundtrack. Featured in the spots are Jermain Defoe (Tottenham Hotspurs and England), Arjen Robben (Chelsea FC and Netherlands), Djibril Cisse (Liverpool FC and France), Kevin Kuranyi (Schalke 04 and Germany). As the players themselves are disassembled and reassembled, their sportswear is animated to demonstrate the wide range of options made available by Adidas. Studs unscrew from the Defoe’s boot, revealing options for hard and soft ground. We see the soles of the soccer boot chassis revealing lightweight and comfort options. Cisse interacts with a range of coloured boots. Gloves are animated to demonstrate a range of designs for for cool and warm climates, wet, dry and hard games.